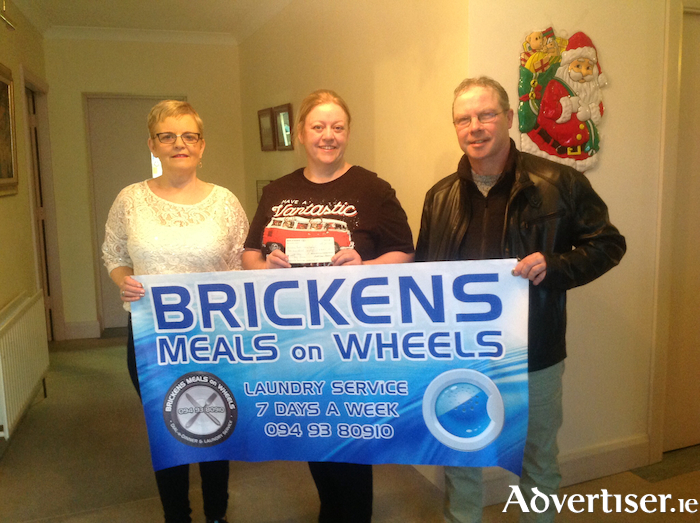 Presentation by Kathleen Henry (right) and Michael Sloyan of the Brackloon Reunion committee, Ballyhaunis to Lorraine Lowry (centre), manager of Lohan Park Group Home which operates Brickens Meals on Wheels. Continuing the legacy of recent Brackloon Reunion activities, the committee presented a cheque of €200 to the Lohan Park Group Home and retirement village which operates the locally acclaimed Brickens Meals on Wheels service in the general Ballyhaunis and Claremorris district. This valued facility provides an ongoing provision of hot meals and laundry services to local communities which is greatly appreciated. Kathleen Henry and Michael Sloyan presented the cheque on behalf of the Brackloon Reunion committee to Lorraine Lowry, manager of the Lohan Park Group Home and Retirement Village. The committee wishes to acknowledge all the active and financial support from the locality, valued sponsorship, and Mayo County Council, that has enabled the committee to carry out heritage activities and the ability to make a contribution to this worthy cause. The committee especially thanks local heritage and community groups which contributed localised magazines that were part of a heritage charity book sale in the Ballyhaunis Friary at a recent event. Book contributions were made by the committees of the Annagh magazine, Glor Aghamore, Kilmovee/Kilkelly Annual, Echoes - Ballaghaderreen, and Brusna publications.